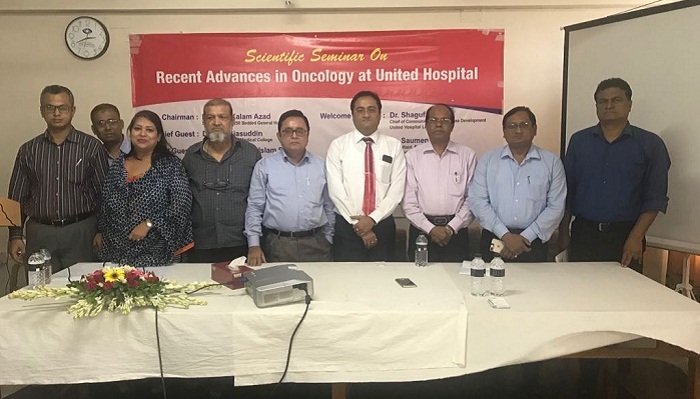 Recently United Hospital Limited organised a Scientific Session on “Recent Advances in Oncology at United Hospital” at the Conference Room (2nd Floor) of 250 Bedded General Hospital, Jashore. Dr Saumen Basu, Consultant - Radiation Oncology Department of United Hospital Limited was the Speaker of the Session discussed different important aspects of Radiation Oncology. Dr Abul Kalam Azad, Superintendent, Prof. Dr Md. Giasuddin, Principal – Jashore Medical College & Dr AKM Kamrul Islam Benu, President – BMA Jashore & Dr MA Bashar, Secretary – BMA Jashore, Dr Atikur Rahman, President- SWACHIP Jashore & Dr Shagufa Anwar, Chief of Communication & Business Development of United Hospital were also present along with other doctors in the session. Dr Shagufa Anwar delivered the welcome address to the participants of the Session. Around 150 doctors from 250 Bedded General Hospital, Jashore participated in the Session. The questions and answers session at the end was very interactive.